This area shows you the explanation of the differently colored taskbars. With the colored taskbars, you can quickly get to know whether a task is incomplete or complete or outstanding. You can also see if there is any milestone with the help of color. You will see different bars that indicate the status and duration of the tasks. These are called taskbars. The longer the duration of a task the more stretched the bar for that task will be. 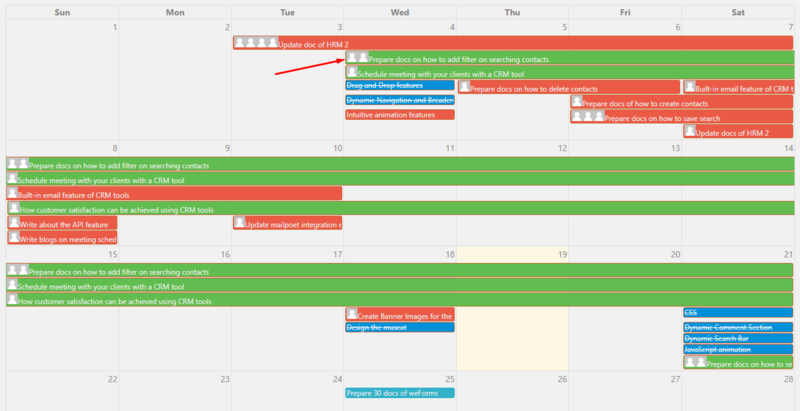 The Red bars represent the due tasks or outstanding tasks or the tasks that have a starting date but do not have a due date. 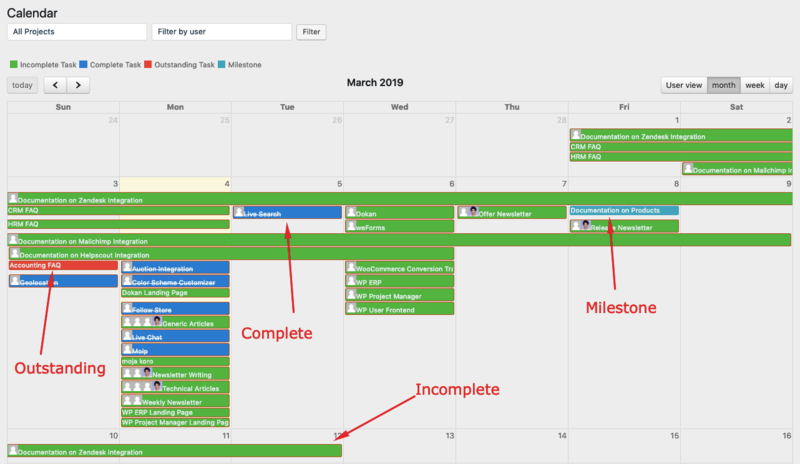 The Green bars represent the ongoing tasks or the tasks your team members are working on. The Blue bars represent the completed tasks. The light Blue bars represent the milestones you set for the project. 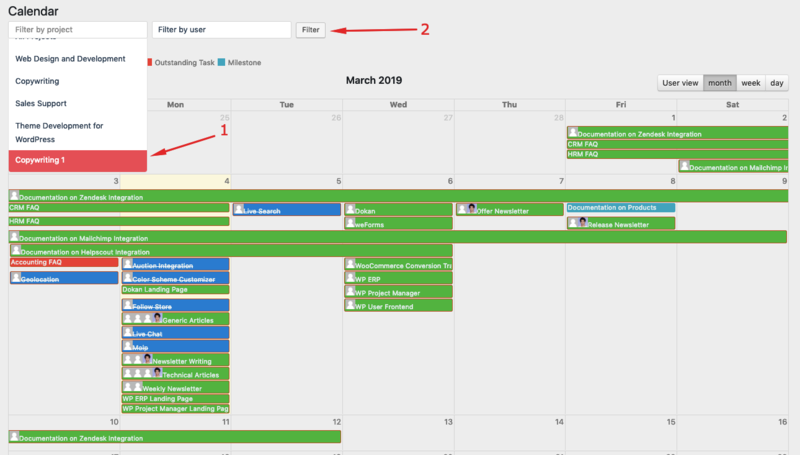 When you navigate to the calendar, it will show all the tasks for all the projects and users you create. But you may wish to see only the and tasks for a particular project and user. Another is selecting a user. The other is by selecting both a project and a user. Choose a project from the dropdown list and hit the Filter button in order to see your desired project's tasks. 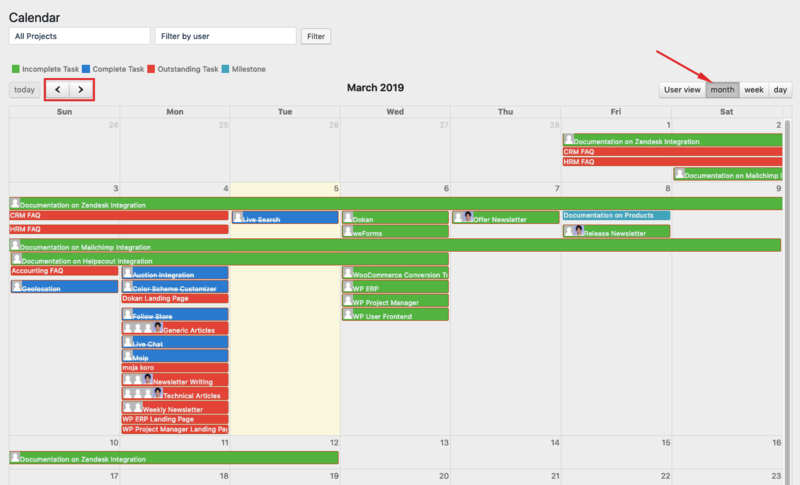 You can also choose the monthly, weekly and daily options to see the and tasks. 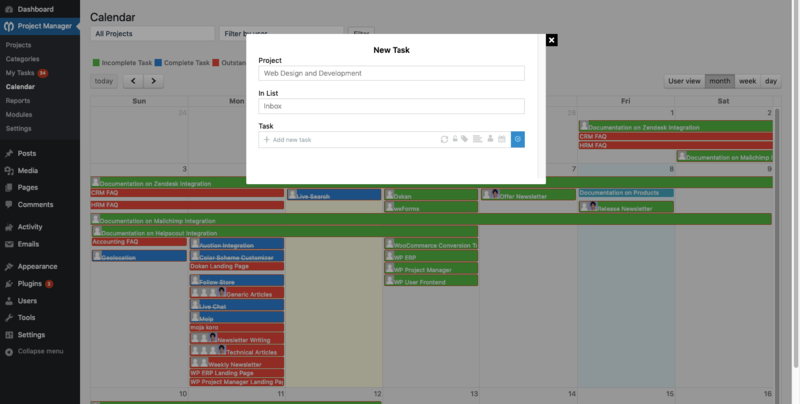 See all the tasks from users' perspective by selecting the User View tab. However, you can also choose certain users and projects to filter tasks and get a user view. 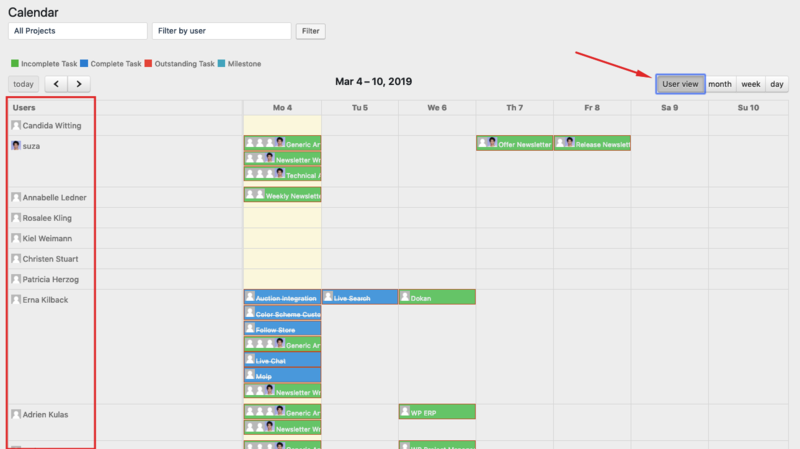 The user view will only show tasks for one week. You can easily navigate between dates in this view using these two icons (<,>). 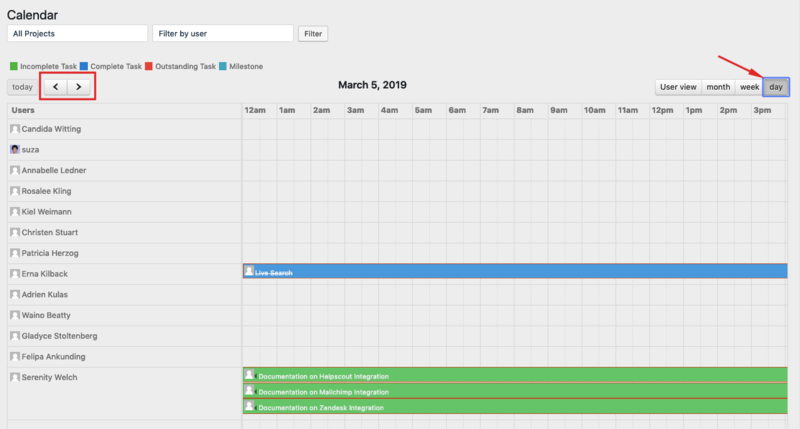 You can also assign tasks from one user to another user by simply dragging and dropping a task in the calendar. For example, you have two users. One is Felipa and the other is Gladyce. Now, if you move a task of Felipa to Gladyce by dragging and dropping then Felipa will no longer remain assigned to that task. Rather Gladyce will be assigned to that task. Another thing is when you are dragging and dropping a task to a different date the date will also be changed accordingly. Selecting this option will only show you the tasks on a monthly basis. Use the left single arrow and the right single arrow to navigate to the previous and next months. Selecting this option will only view the tasks for a weekly basis. Use the left single arrow and the right single arrow to navigate to the previous and next weeks. Selecting this option will show you the tasks on a daily basis. The daily view counts and shows tasks from 12 a.m. to 11 p.m. of a day and so it is a 24-hour-calendar view. Use the left single arrow and the right single arrow to navigate to the previous and next days. you can use the ‘today‘ button to quickly navigate to the tasks for the current day you are working on. The button remains deactivated if you are already on the day you are working. The dynamic and interactive drag and drop functionality will provide you with a seamless experience. For example, on 19th August, you see that the following “test task” has a start date of 17th August and the due date is 18th August. Thus on 19th August, the task will be due and so it will be red. If you drag the task and drop it on the next day it will automatically become an outstanding task and the color will also be changed. If the color does not change then consider reloading the page and the color will change on its own. You can also create tasks very easily in the calendar. This works in all view (User view, Monthly view, Weekly view, and Daily view) options. To do so, select a blank area or the date in which you want to create a task. After that, you will get a pop up to add tasks. You can select a project, specify task list, give a project name, add users, set deadline, give label and so on. Note: If you are yet to know how to create a task, read this tutorial (Adding task to the task list). A pop window for editing the task will appear immediately. From here, you can edit the task name, change the start date and the due date etc. 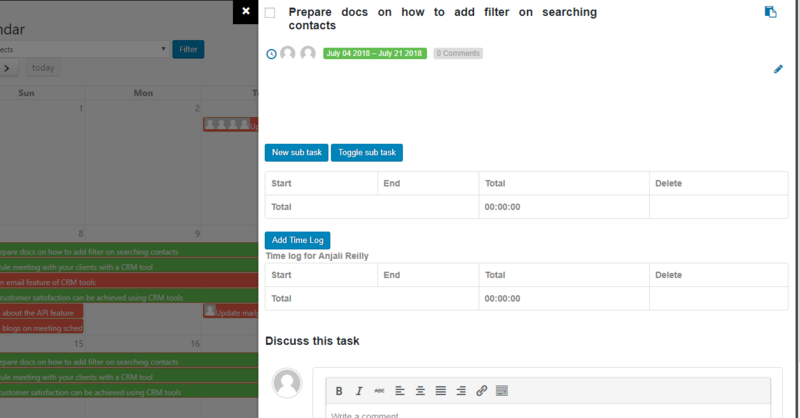 You can even create subtasks and add time log from therein. If you want to know how to create a subtask then go through this tutorial. That's all about Project Manager Calendar.